Lilly just arrived at Mickaboo and is adjusting well. 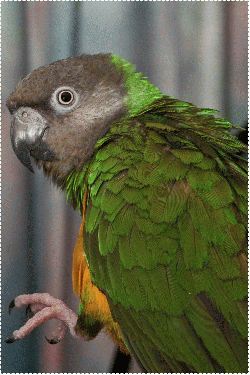 She is a young, beautiful, and gentle bird who was surrendered due to family changes. Despite not being handled for many years, Lilly is eager to interact and offers her foot to step up whenever someone nears her cage. She loves sitting on a playpen, and is very gentle and friendly. She begs to step up and has stepped onto her foster Dad’s finger a few times without trying to bite. She loves the back of her head and neck petted. If you’re interested in a friendly companion, please contact Lilly’s coordinator.